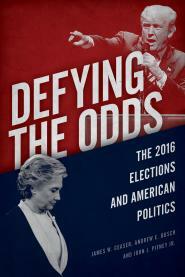 In Defying the Odds, we discuss polarization in the 2016 election. In response to the shutdown, Speaker Pelosi suggested postponing the State of the Union, or having POTUS deliver it in writing. Trump supporters denounced her statement. But a few years ago, some conservatives suggested the same thing. Congressional Republicans are searching for ways–short of impeachment or shutting down the government–to respond to President Barack Obama’s seizure of arbitrary power over immigration law and enforcement. One way would be to cancel the State of the Union address next year, so that the elected representatives of the people do not have to listen to, or applaud, a man who is violating his oath of office and governing as a tyrant. Yesterday we saw a number of ideas floated about how to respond....rescission, lawsuits, de-fundingand withholding votes on nominees to name a few on the table. There's one idea I'd like to add that is in many ways symbolic but that would focus the nation on the seriousness of this problem, do not invite Obama to address a joint session of Congress to deliver the State of the Union address.